Time was, not so long ago, when Regent was a name to conjure with in international luxury travel. In the 1980s and early ’90s, Regent ran a string of posh city hotels and resorts in places such as Bali, Sydney, Jakarta and elsewhere around the globe, all well-respected and sometimes adored. Four Seasons bought the Regent brand in 1992 and sold it to Carlson Hospitality Group in 1997. As time went by, Regent lost its once-high profile. Some properties were sold off individually, including the Regent Hong Kong (now an InterContinental), one of the few hotels that deserves to be called iconic. Given all that, I wasn’t sure that the brand I admired back in the day still existed. As my recent four-night stay at the Regent Taipei, in the heart of Taiwan’s capital city, showed, however, Regent does indeed exist, and it’s growing again. 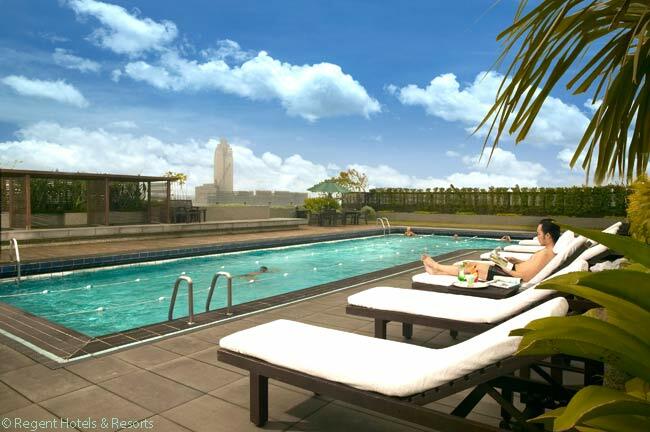 Indeed, Regent-branded hotels are opening in Asia, Europe and, potentially, North America. Taipei-based, Taiwanese-owned Formosa International Hotels Corp. (FIHC) bought Regent from Carlson and Rezidor Hotel Group AB in 2010. 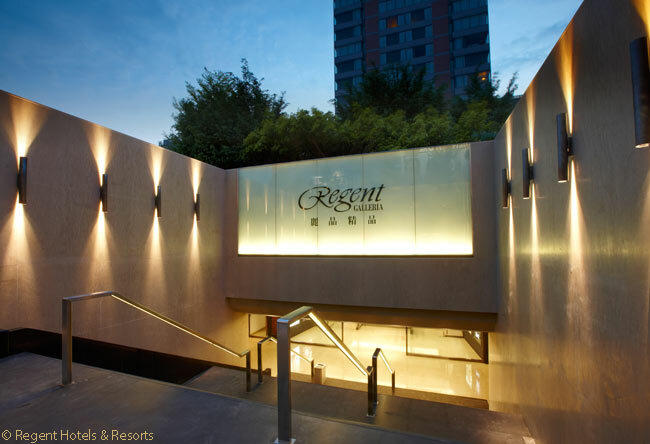 As FIHC’s prime hotel, the Regent Taipei, ensconced in a high-rise building above the posh Regent Galleria shopping mall, is also the flagship property of the reconstituted Regent Hotels & Resorts. So much for the back story. What of the hotel? It is, in a word, resplendent. 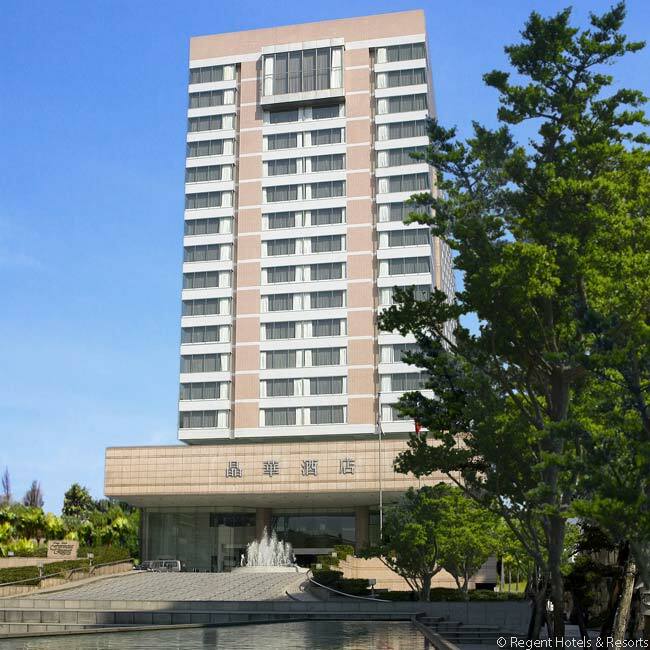 The property opened in 1990 as the Grand Formosa Regent Taipei. Of course, business and leisure travel have changed a good deal since then and the hotel has been extensively renovated several times. 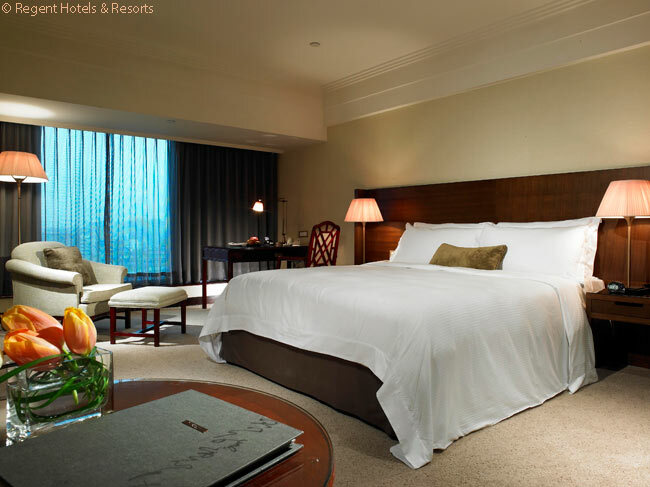 As I discovered during my stay in September 2013, the Regent Taipei has the requisite high-tech bells and whistles that guests expect nowadays, such as high-speed Internet connections in guest rooms and Wi-Fi in public areas. The hotel’s Wellspring Spa provides state-of-the-art pampering with Asian grace notes. All told, the property positively gleams. At 21 stories high, kitted-out with 478 guest rooms and 60 suites, the Regent Taipei is too big to be a cozy boutique hotel. But it has the high staff-to-guest ratio of a classic 5-star, and the refined service helps make the hotel feel more intimate than its scale would suggest. The Regent rises above Zhong Shan North Road, a busy, handsomely designed boulevard, and the view from the upper floors is sweeping. From my club-level room on the 19th floor, I got a terrific view over Taipei, a vibrant capital city of 3.9 million people nestled amid green mountains edged with serrated ridges. In the middle distance I could see Taipei 101, the 101-story skyscraper that was for several years the world’s tallest building. Segmented in eight vertical sections, its silvery metallic skin gleaming on sunny days, Taipei 101 was designed to resemble a stalk of bamboo, suggesting both strength and flexibility. 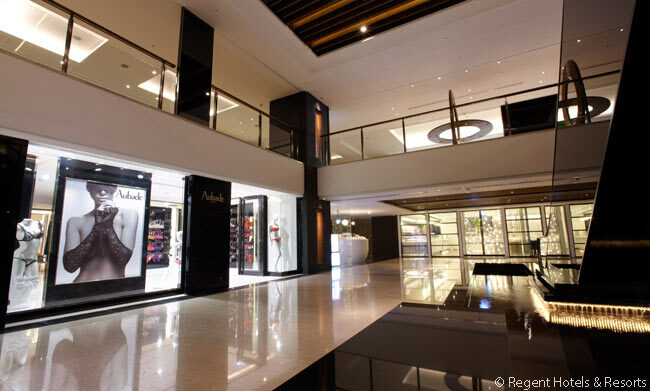 Back on Zhong Shan Road, the Regent Taipei sits atop the five-level Regent Galleria, an upmarket shopping mall stacked with 50-some designer boutiques and restaurants and bristling with famous global brands. All the usual suspects are there. The place seems to be bustling whenever you descend from the hotel by elevator or trundle down the stairway to the galleria. I find 5-star Asian hotels to be welcome oases amidst the bustle of big cities, especially in places like subtropical Taiwan, where heat and humidity can sap even the most determined traveler. 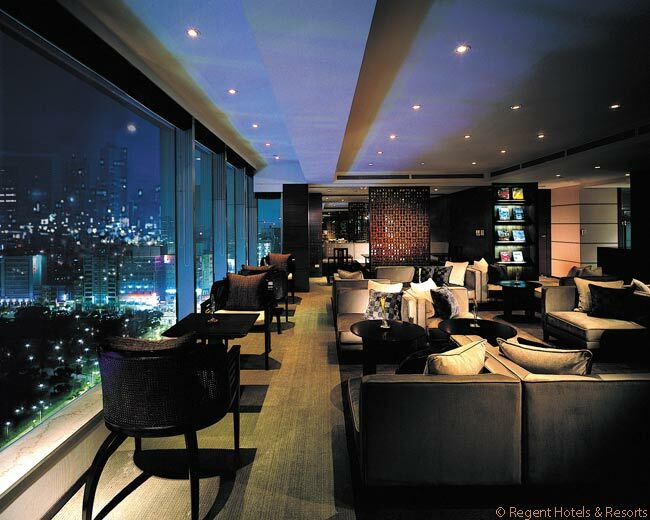 The Regent Taipei is one such oasis, where a cold drink and cool blast of air-conditioning are easily secured. I hunkered down in the Regent Taipei’s Tai Pan Residence & Club. 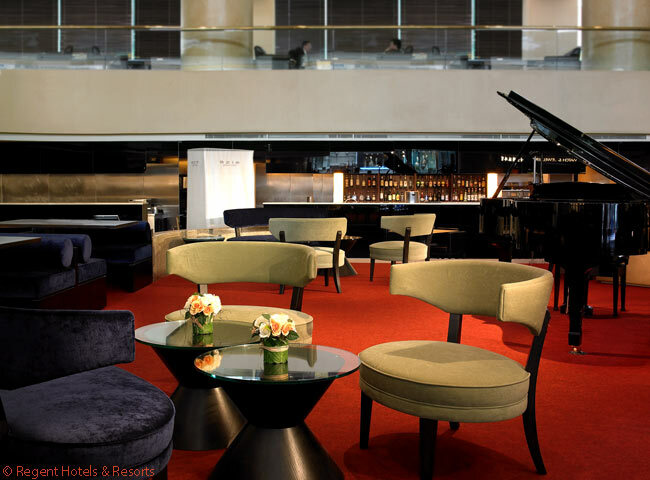 This elite section of the hotel, located on the 18th and 19th floors, features amenities such as 24-hour butler service and a savory breakfast buffet in the spacious and well-appointed 19th-floor Tai Pan Lounge. Evening cocktails and hors d’oeuvres are also served in the lounge. 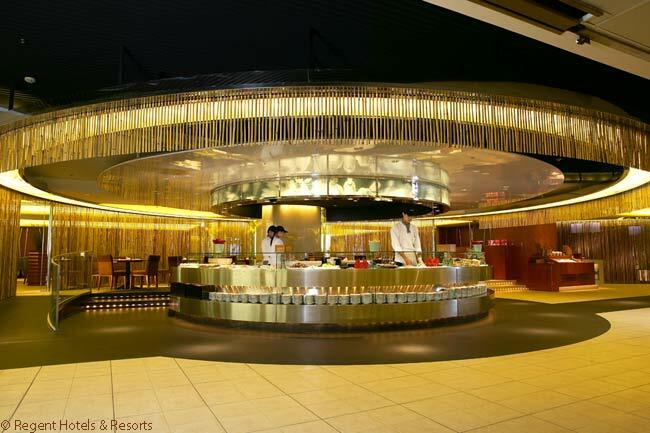 Tai Pan status entitles guests to a complimentary pressing of business attire at arrival. Additionally, the Tai Pan Lounge has several PC work stations; I used them to write, Web-surf and check my e-mail. My 45-square-meter (484-square-foot) room was stylish and comfortable, combining modernity and tradition. Softly whooshing sliding wooden closet doors, designed to resemble window shutters, held pride of place, along with a big-screen LED television and an ergonomically correct Aeron chair. 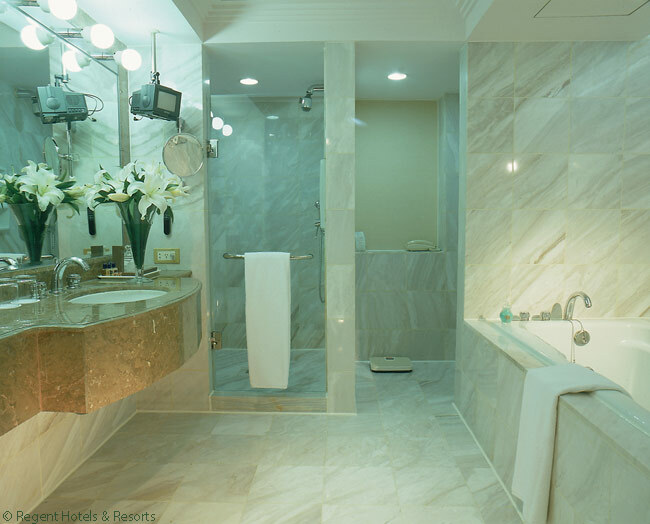 In the marbled bathroom, which came with a separate shower and a deep-soak bathtub, were ample mirrors, lighting and vanity counter space, as well as Hermes amenities. The main part of my room included a comfortable couch, a work desk with a good chair and a plush, comfortable bed with a contour-to-body Wellspring mattress. Beyond the food and drink available to high-paying guests in the Tai Pan Lounge, the Regent Taipei has seven restaurants open to hotel guests and locals. Fresh-made Chinese, Japanese and other Asian cuisines are on offer, as well as Western food. The cooked-to-order omelets are especially good. Moreover, the hotel has the location, location, location thing covered. Zheng Shan Road, humming past the Regent’s main entrance, is nicely landscaped and lined with shops, restaurants and hole-in-the-wall haunts that sell refreshing treats like chilled bubble teas, said to have originated in Taiwan. Taipei’s Museum of Contemporary Art is about a six-block walk away. I bought my wife a tiny, hand-crafted leather change purse in the museum shop; she affixed it to her keychain, a small keepsake from Taipei. Ah, yes I think, remembering the trip, it’s good to have Regent back in action. The Regent Hotel Taipei is located at No. 3, Lane 39, section 2, Zhong Shan Road North, Taipei 104, Taiwan, Republic Of China. Telephone +886 2 2523 8000, or visit www.regenthotels.com for bookings and information. Rooms range from 13,600 New Taiwan Dollars (US$448) per night for a Superior room to NTD 80,000 (US$2,635) per night for a large suite on Tai Pan floors. Special offers and the hotel’s Web site sometimes offer substantially lower rates. David Armstrong is a San Francisco Bay Area journalist specializing in features, news and reviews about travel destinations, airports, airlines, hotels and resorts. He is the former tourism, aviation and international trade reporter for the San Francisco Chronicle and covered tourism, movies, media and theater for the Hearst-owned San Francisco Examiner. He is the author of five books and numerous travel articles for TheStreet.com, Travel + Leisure, Global Traveler, Napa Sonoma Magazine, The Globe and Mail (Toronto), Toronto Star, Chicago Sun-Times, Aviation.com and many others.